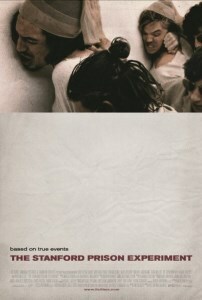 Fantasy becomes near unbelievable reality in Sundance hit The Stanford Prison Experiment (2015), director Kyle Patrick Alvarez’s astonishing third feature film which sees him make a deserved return to the Edinburgh International Film Festival. Formed around the real life experiment conducted in 1971 by professor Philip Zimbardo (Billy Crudup), the film is often excruciating to behold, but ultimately fascinating and thought-provoking, every inch of the screen filled with impeccable detail and underlying meaning. Twenty-four students were selected to take part in a unique psychological test after responding to an advertisement in a local newspaper. The group were stripped of their clothes, possessions and identities, half of them made prisoners, and half made prison wardens. The study, due to last two weeks, came to an end after only six days as the test quickly unravelled from meticulously planned psychology examination into disorder, mental instability and violence. Filmed with exacting precision by Alvarez and DoP Jas Shelton, The Stanford Prison Experiment seeps under the skin, unsettling and captivating in equal measures. The whole film, from start to end, is full of suspense. It’s a slow, steady build up that fosters unease in every frame as power becomes an uncontrolled drug to the wardens, and they exact this in ways that perturbs and causes unrest amongst the prisoners, whether it be emotionally, physically and mentally. The controversial events have been adapted with remarkable authenticity by writer Tim Tabbott, whose script aptly concerns itself with the cracks under the impeccably designed surface rather than the more thriller elements of the narrative. The technical credits are exceptional, right down to the score, which acts like a heart beating ever faster as the study unravels, thumping with a powerful intensity until the quiet calm that ends it. Each and every cast member makes an impression, from Crudup’s professor, torn between achieving the results he set out (often as the expense of the students’ wellbeing and his relationship with his long-term girlfriend) and keeping things as above board as possible to Ezra Miller’s full-throttle performance as the prisoner rival to Michael Angarano’s warden. The situation has a marked effect on each of them; the scars becoming ever clear as the camera lingers on their faces. The Stanford Prison Experiment is a step up for Alvarez – a far more accomplished film than his others. It’s also deeply unnerving, but in a way that demands investment and cuts deep down in the mind.